Numerous books have been written about Warren Buffett over the years and he is firmly established as a renowned figure among investors all over the world. In contrast, not so many authors have focussed on Charlie Munger, who has been Warren Buffet’s partner for more than five decades. Griffin’s book closes that gap. The book is definitely worth reading, particularly as it encourages readers to reflect upon their own investment strategies. 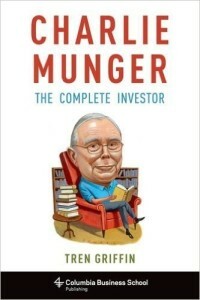 Munger is famous for being a voracious reader. His children once drew a picture of him as a book with legs. He apparently reads a complete book every single day and his interests cover almost every conceivable subject area. He is a firm believer in extensive general knowledge and is convinced that a multidisciplinary approach is more rewarding than specialized expert knowledge. Munger recognizes that investing involves much more than just numbers and calculations. “People calculate too much and think too little”, is one of Munger’s maxims (p. 46). Every investment decision involves a large number of immeasurable and unquantifiable factors. “You know, they’re important, but you don’t have the numbers. Well, practically everybody overweighs the stuff that can be numbered, because it yields to the statistical techniques they’re taught in academia, and doesn’t mix in the hard-to-measure stuff that may be more important. That is a mistake I’ve tried all my life to avoid, and I have no regrets for having done that.” (p.45). This is strongly linked with the “Overoptimism Tendency” (p. 74), which leads many investors astray. An eagerness to think and act in conformity with those around us (“Social-Proof Tendency”) is the root cause of many misjudgments. Patient. Here it is important to resist the tendency towards hyperactivity and to wait patiently for the right investment opportunities – and to spend this time not taking action. Disciplined. This goes hand in hand with point 1, dealing with having the discipline to bide your time and wait. Calm – but courageous and decisive when opportunities presents themselves. Another major factor behind successful investments is for investors to recognize the limits of their own aptitudes. Munger and Buffett have turned down lots of investment opportunities because they were too complicated and outside their circles of competence. Anyone who doesn’t know the limits of their abilities is in truth incompetent. (p. 122) You should be particularly skeptical when presented with a catchy, plausible sounding, “investment story”. A number of the biggest frauds in financial history resulted from the fact that the fraudsters – such as Bernie Madoff – were great story-tellers (p. 123). When an opportunity presents itself, a “fat pitch” as Munger calls it, you need the courage to strike quickly and invest big – it is widely known that Buffett and Munger eschew vast diversification, believing instead in the value of holding a concentrated investment portfolio. The secret of Munger’s success can be summarized as follows: “The wise one bets heavily when the world offers them that opportunity, They bet when they have the odds. And the rest of the time, they don’t. It’s just that simple.” (p. 130). R.Z.